Inspired by one of the finest hours in its history, Vulcain revives the original spirit of the alarm in The Heritage Presidents’ Watch limited series. An identical re-edition of the 1950 model, it houses the famous hand-wound Cricket V-10 movement. Available in steel and in steel/18K rose gold versions, this model pays tribute to its predecessor which made an unmistakable mark as the Presidents’ Watch. Vulcain has made an indelible imprint on the history of alarm watches. In 1947, the brand presented the Cricket alarm calibre that was to become a legend – a movement sufficiently innovative to equip a number of Vulcain wristwatches that were worn by many of the world’s most powerful figures. 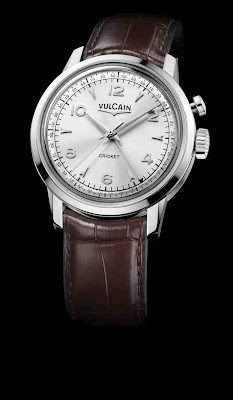 American presidents succumbed in their turn to the charms of this model, to the point where the Vulcain alarm watch was quite simply dubbed “The Presidents’ Watch”. Vulcain pays tribute to this legendary model by creating The Heritage Presidents’ Watch, a faithful reproduction also endowed with the latest technological innovations. Equipped with the legendary Cricket V-10 calibre and its balance beating at 18,000 vibrations per hour, it is endowed with a comfortable 42-hour power reserve. This 157-part calibre also powering a date display is fitted with two barrels: one to supply the energy required for the hours, minutes and seconds functions, and the other to drive the alarm function which sounds for a full 20 seconds and has forged its reputation for over 60 years. Its illustrious forerunner was available in an 18K rose gold/steel version, and The Heritage Presidents’ Watch also comes in an additional all-steel variation. It is fitted with a cambered sapphire crystal and a sapphire crystal case-back enhanced by the stylised “V” for Vulcain – or with a solid double case-back on request. Both models offer a choice of anthracite or silver-toned dial, and the original case diameter has been fractionally widened from 38 to 39 mm. Since 1858, Vulcain has constantly explored new technical and aesthetic horizons in renewing horological traditions. The Heritage Presidents’ Watch is a tribute to history and to the Cricket alarm movement that both reflects and perpetuates this avant-garde vocation.